Both Athens and Kalamata possible. From Kalamata four times a day there are buses via Tripoli to Nafplio. Athens: The cheap option: Express bus No. E 93 from the airport to the bus station on Kifissou-Str. take – costs 2.90 €. Ticket is valid for 24 hours for all transport within Athens. Travel time depending on traffic 30 to 60 minutes. Of course you can also take a taxi, but that costs a lot of money. If the driver does not understand English, which is rare, then ask “Stathmos Leoforíon, Kiffissou”. Luggage will be charged in addition to the fare indicated on the meter. At the bus station, pick up tickets to Nafplio just to the left in the ticket hall. The seats are numbered. Direction “Argolida” is right at the exit of the large hall on the far right, next to the taxi departure. On the bus is “Nauplia” or “Nafplio”. Buses run every half an hour on weekdays, every two hours on Sundays. Driving time two and a half to a maximum of three hours. Last bus from Athens at 8.30 pm, Fridays and Sundays at 10.30 pm! Departures from Venice, Ancona or Bari possible. In Patra, leave the port to the left and follow the signs Athens – “Athens”. On the highway toll is due. Approximately 200 km to Nafplio.In the vicinity of Corinth do not leave the highway, follow the green motorway signs towards Tripoli. After 14 km tollbooth. Use the exit “Ancient Nemea / Nafplio”. Approximately 3 km further on, there is a railroad crossing, where you turn right. 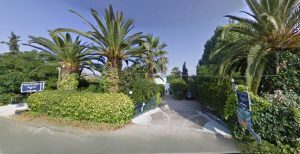 About two kilometers further, tucked away in the bushes, are two nice tavernas. Shortly thereafter, several stalls come with wine, honey, fruits and vegetables. There are also two taverns. About three kilometers further on, a signpost turns left towards Mycenae and Nafplio, where you turn onto a new road. Attention, there are often radar controls! Crossroads left to Mycenae, right to Fichti. On the way there is a signpost to the left to an ancient Hera temple – “Ancient Ireo”. Then there are several runs: 1. Agia Triada, Poulakida, 2. Agia Triada, Midea 3. Arachneo, Agia Triada, 4. Panariti. 2.2 km after that comes a left exit, which has been badly signposted. On the right is a signpost for “Epidavros” and “Tolo”. On the left is another signpost. It is “Epidavros” turn, but unfortunately only in Greek. Turn left there. At all following roundabouts always take the second exit, so in principle always go straight ahead. At the third roundabout go straight again towards Tolo. We assume that the gyroscopes all still get proper direction signs. 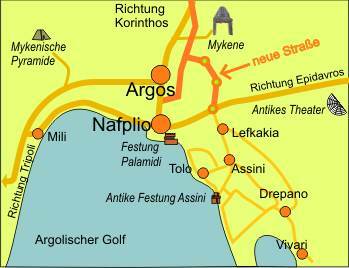 If you have driven another route to Nafplio, turn left in the center at the big crossroads towards Epidavros. After 3.3 km comes the new large roundabout. Turn right towards Tolo. In the village Lefkakia turn right direction Tolo. Behind the town Assini comes a roundabout, there keep left. After about 900 meters turn left towards Drepano. Sign “Bungalows Ingrid” After 200 meters the destination is reached – turn left! 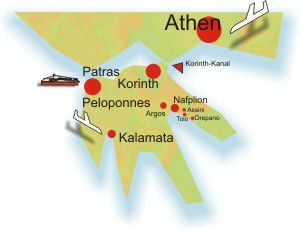 If you get lost in Athens, which is very likely, head towards the center – “KENTPO” and look for signposts to “Korinthos”. Even if it takes you to Pireas, that’s still not a broken leg. Always along the harbor and there follow the signs “Korinthos”. Ask the rental car company for a map of the Attica region!